You might’ve just created the best email in the world. But if nobody opens it, the email will never have the chance to accomplish the goals behind it. For all practical purposes, a 0% open rate means that you failed. Just like with a blog post, the heading/subject line should never be a second thought. It is just as important as the actual content, acting as its own mini-marketing campaign encouraging the intended audience to give it attention. An infographic by Invesp shares that 47% of recipients open email based on the subject line. Coming up with the perfect email subject line is as much science as it is art. As such, we’ll give you the tools to succeed, but it’s ultimately up to your knowledge of the audience to make sure that your subject line resonates. The first piece in crafting a successful email subject line is understanding basic psychological principles that encourage people to take action. People are always plagued by the fear that they’re going to miss out on something. By using the email subject line to indicate that there is a limited amount of something left, the recipient is more likely open the email. When asked a question, people usually want an answer, so they’ll be more likely to open up the email to find it. Appeal to your audience’s curiosity. Having a subject line that is bold can quickly grab the recipient’s attention. Based on how you lure them in, they’ll be curious about what you mean, or the direction you take on the topic. By writing a subject line that suggests that the reader is not the best, they’re more likely to open the email. Just proceed with caution – there’s a fine line between grabbing someone’s attention, and insulting them. It might seem basic, but having a subject line that identifies with the audience in some way can help your open rates. The goal is to get your recipient to identify with the first couple words, say to themselves, “Oh that’s me!” and open it up. When you go to the movies and there is a cliffhanger, it’s rather upsetting. People are compelled to resolve the conflict. Same with email If only half of the subject line is readable and it’s followed by an ellipse (…), a recipient is more than likely going to open it to feel satisfied. Sometimes being direct is the way to go. Recipients don’t like to be mislead, and these types of emails deliver on the promise made by the subject line. 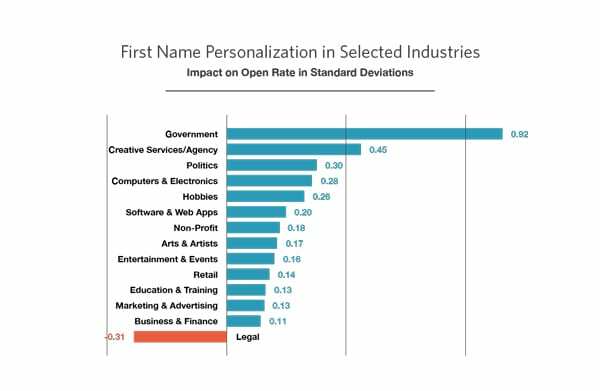 Did you know that emails with personalized subject lines are 26% more likely to be opened? This should make sense, because to a human being, there is nothing that sounds sweeter to them than their own name (at least according to Dale Carnegie in How to Win Friends and Influence People). Experian expands on this point, sharing that personalized promotional emails had 29% higher unique open rates and 41% more unique click-through rates in 2013. Though this fact is a bit dated, the principle is still one worth exploring. According to a report by Experian, fifty-six percent of brands using emoji in their email subject lines had a higher unique open rate. So if you haven’t considered using them before, start brainstorming how they could be implemented for future email sends. Campaign Monitor shares the technical details regarding emoji email subject line use, which can be useful in terms of email client compatibility. Clearly, words matter. And some words are more effective than others. 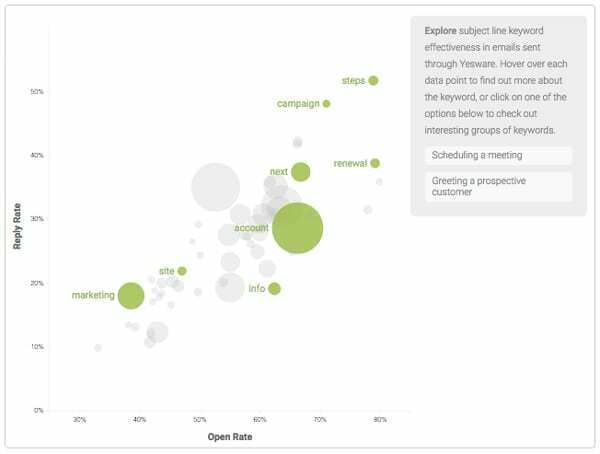 Yesware, an all-in-one sales toolkit that integrates with Gmail and Outlook, created a data visualization that showed how different words had an effect on open rate for sales emails. The effect of specific words on your audience will depend on your industry, goals, and intended actions. Just as there are a lot of statistics to back up email subject line best practices, the data also reflects on several practices to avoid. On a usability note, don’t ever use ALL CAPS. Nobody wants to open an email that is yelling at them. Writing a subject line (or email body copy) in this fashion is considered aggressive, and could possibly make the recipient think it’s spam. Finally, It’s ok (and encouraged) to create an email subject line that piques curiosity, but don’t deliberately mislead. If a person’s expectations are not met, they will more than likely unsubscribe from your emails, and report them as spam. According to Campaign Monitor, about 53% of emails are opened on mobile devices. A study by Return Path found that open rates were 12.5% higher where subject lines contained less than 49 characters, though data was largely based on the retail industry. 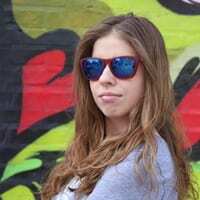 Though Mailchimp states that the subject line length doesn’t actually matter, they recommend giving some attention to length based on how email subject lines display on mobile devices. 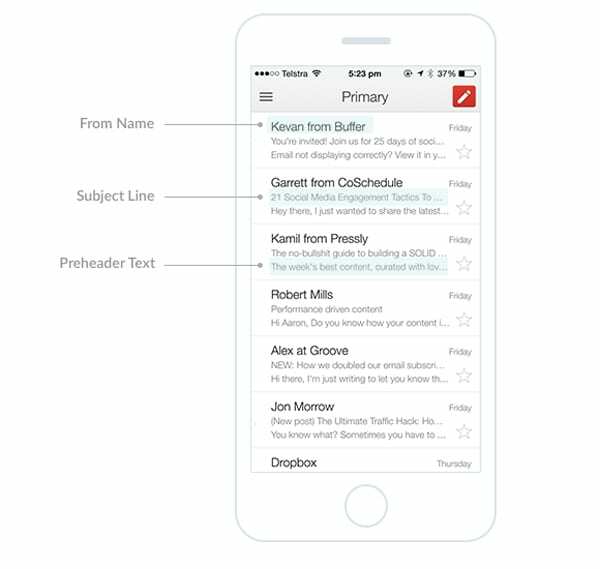 Zurb has a free tool for testing how subject lines display on popular mobile devices. Speaking of mobile, you haven’t optimized your open rate completely without giving some attention to the preheader text. Many mobile email providers show a short line of text to add some context for the recipient and to allow them to pre-screen the email before opening. Say you’re sending an email about coffee consumption – it may resonate best if sent in the morning, when someone is more likely to be consuming coffee. Your email service provider (ESP) can provide specific details about the best time to send emails based on your industry and unique company data. A no-brainer for increasing email open rates is to be consistent with email frequency. 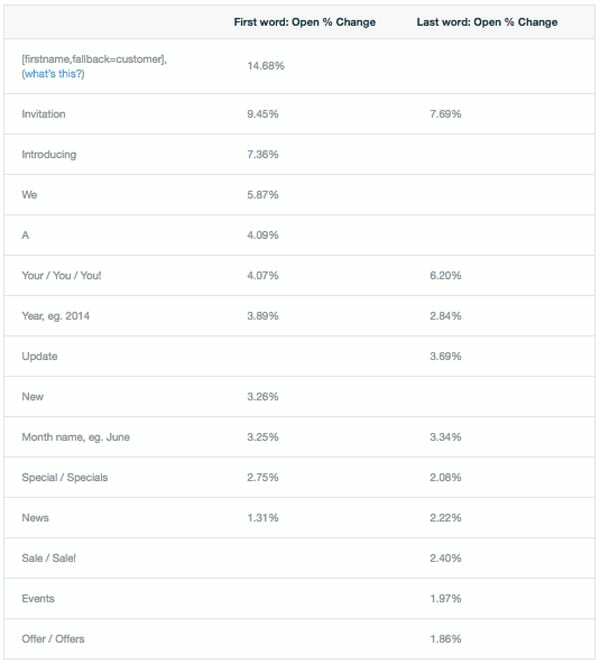 The Database Marketing Institute found that open rate was highest when companies send two emails per month. Don’t give customers the chance to forget about you by waiting too long between email sends. Similarly, don’t annoy them with no emails one week, and four the following week. Once you’ve created a theory for your perfect email subject line, do an A/B test. Send half of the recipients on your list (or on this test segment) one type of subject line, and the other half a different version. Alternatively, try changing the order of words to see if one subject line converts better than another. Monitor which one has the best open rate, and apply your learnings to the next email send. Email success starts with email subject lines. If yours are a second thought compared to the body of your email, you have the wrong perspective. By spending time to make your email subject lines better and aligning content with expectations, you’ll improve your email open rates.